Oh those lucky science majors: They take their SATs, ACTs or GREs - depending on undergrad vs. graduate school - write an essay, fill out an app and hit submit. Theater majors, on the other hand, who are heading for a serious drama school or top-ranked theater conservatory face a completely different application process. Theater students aren't the only ones facing auditions, of course. Music students do also, and some of the considerations that affect them - about scheduling, flights and arrival tips and tricks - will be useful for drama majors too. Here are 10 audition tips specific to drama students. Most schools ask for two dramatically different monologues, typically something classic - Shakespeare, for example - and something contemporary. Your child should choose carefully. He or she should pick something from a play, not a movie, TV script, novel or - worse - monologue collection. Pick something that's age-appropriate - no Lady MacBeth, no Blanche Dubois, no aging hookers or irascible codgers. Do not choose a monologue that requires an accent, unless your accent is impeccable. Avoid monologues that require you to unleash profanity-riddled rants at the audition panel. Controversial topics may work in the context of a full-length play, but they don't in a 2-minute monologue and "drug-addicted prostitute" is never a good first impression for any 18-year-old, theatrical or not. 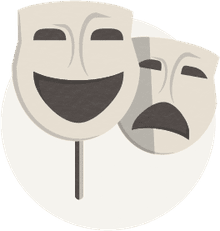 The audition panel usually asks applicants why they chose these particular monologues, a question that requires knowledge of the play and the place this particular monologue occupies in it. Know the character, the plot and the meaning of this particular speech. Be prepared to explain your interpretation of the character's words, not repeat what has already been said or written about him or her. Memorize everything. If they ask for two monologues, prepare three or even four, just in case they want more. Bring extra copies of your resume, the headshot and contact information. Also, copies of any audition tapes, both audio and video, are a good idea. You cannot sing by yourself for a musical theater audition - the audition panel wants to hear you match pitch. Give the pianist a crisp copy of the music, backed by cardboard or stiff paper so it doesn't fall over, and taped together so it all lies flat. Mark any repeats or retards carefully and clearly. Hand the music to the accompanist and quickly, quietly confer. Do not, under any circumstances, snap your fingers or call out directions - faster, slower - to the pianist when you are performing. It's rude and unprofessional. Don't forget to retrieve your music at the end. Some auditions include a movement component. Read over the audition materials carefully so you know what to expect, and can dress accordingly - and like a professional. Do not wear anything too short or too revealing, and do not wear shoes that you are not comfortable performing in. Hair and makeup should be neat, clean and appropriate to the situation. Don't dawdle or vamp. Walk in like you know what you're doing, take your position on stage and introduce yourself - your name, your character, the playwright. Make eye contact with the judging panel during the introduction. Keep the drama to your audition and show yourself to be a mature, reliable young adult who can answer questions competently and feels comfortable speaking in front of others. Fix your gaze on a point above the audition panel's heads during the monologue. They are observing you and taking notes, not interacting with you and they will become acutely uncomfortable if you stare at them. You are acting, not interacting. The panel wants to see how teachable you are so they may ask you to repeat your monologue with all sorts of creative variations - exhort the army in your own words, say the lines as if you were a 9-year-old girl, recite comic verse as if it was tragic. Be ready for anything. And if they cut you off mid-monologue, it means they've heard enough, not that they don't like you. Audition panels are looking for authenticity in their actors. The old saw about the importance of being yourself was never more important than now. When they ask questions, don't tell them what you think they want to hear, speak from the heart. It's not just the audition panel whose opinion matters. A would-be actor needs to treat everyone well - and not just from a karmic perspective, although that too. Act like an arrogant jerk to the department secretary, accompanist or security guard, and the audition panel will find out. The same goes for parents, who should provide quiet, gentle support from the waiting room. How Can You Prepare for Doing a Cold Reading During an Audition?